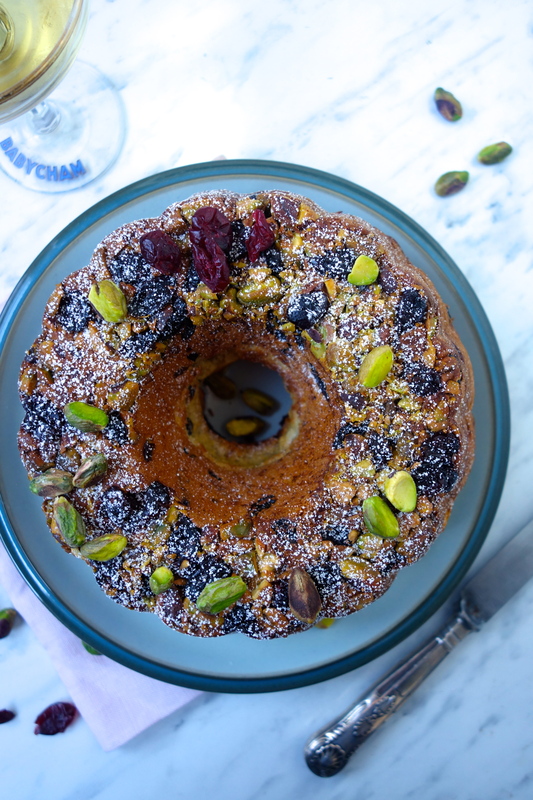 Kouglof (also sometimes known as gugelhupf, or gugelhof) is a cake made out of a yeasted dough, and baked in a circular mould with a hole in the middle – I use my bundt tin. It’s not overly sweet, and the dough in this cake only contains 50g of sugar so it’s more like a slightly sweetened and enriched dough than an all-out decadent cake. I’ve adapted my classic recipe from “A Handful of Flour” and reimagined it in festive guise, with dried red cranberries, green pistachios, top quality vanilla, cinnamon and ginger, and a good helping of fresh orange zest. It smells divine. Combined with the brandy, this fruity dough is a perfect alternative to rich Christmas cakes or mince pies, and is also great lightly toasted under the grill and served with a little butter or jam. It’s also delicious on its own, with a cup of tea or perhaps a glass of Alsace dessert wine. The original version I wrote contains raisins and flaked almonds which work beautifully, but I like the subtle pop of colour the pistachios and cranberries add when we get to this time of year in December. Don’t worry if the dough springs up and rises beyond the height of the tin, as from what I can gather from the name that is what this rather spirited cake is supposed to do! Sprinkle with extra cranberries and pistachios to decorate at the end, as the ones baked into the dough can lose their colour slightly after baking. Place your raisins, along with 20g of your dried cranberries in a small bowl and cover with the brandy. Leave to soak, and set aside. Make your sponge by mixing the yeast with the water and flour in a bowl. Cover with a clean cloth and leave it at room temperature in a draft free place for 20 minutes, until bubbles are forming. You want it to look lively – if the weather is colder, I sometimes give it an extra 5-10 minutes. In the meantime, mix your butter, sugar and salt together using an electric stand mixer with a paddle (you can do this by hand too, it just takes longer). Once it is creamy and light, add the beaten egg and egg yolk, orange zest, and spices. Mix thoroughly, then add the sponge, followed by the flour, and lastly the brandy soaked raisins and cranberries. Beat for a couple of minutes until you have a smooth and elastic dough if you are using an electric stand mixer – it will take a bit longer by hand. Place the dough in a buttered bowl, cover with a tea towel, and rest at room temperature for 20 minutes. Grease a 1.5 litre kouglof tin, or Bundt tin with butter, paying extra care to ensure all the fluted sections are also buttered. Sprinkle in 25g of your remaining dried cranberries, and 30g of chopped pistachios into the bottom of the tin. Place the dough evenly around the tin over the top of the fruit and nuts. Cover with a plastic bag and leave it to rise for an hour at room temperature, or until doubled in size. Preheat the oven to 180ºC. Bake for 35 minutes, or until a metal skewer inserted comes out clean. Leave it to settle in the tin for 5 minutes before turning it out onto a wire rack to cool. Sift icing sugar on top for decoration, and sprinkle with any leftover cranberries and pistachios for extra colour. This will keep for 2-3 days stored in an airtight container, but is at its best on the day of making.